addition of RFID Card Access! The RFID Combi-Cam E Lock has the same very popular features such as 8 year battery life, normal or locker modes, compact size and more. The RFID Cabinet Lock model can be programmed to either accept numerical input or RFID cards, fobs or bracelets. The Combi-Cam RFID Cabinet Lock offers an ergonomic, compact form cabinet lock that makes it more versatile in more applications. The amazing, up to 10 year battery life translates into far less periodic battery changes which requires less labor on cost for years down the road. 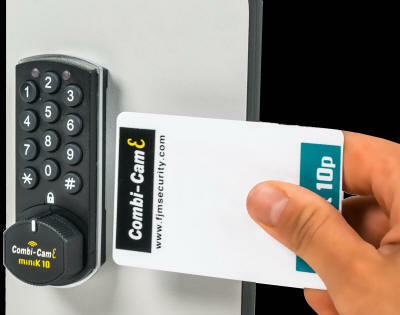 The Combi-Cam E retrofits any cabinet lock application without permanent, further cutouts required to make the lock fit. The Combi-Cam E standard offers a variety of optional programming features and the RFID version adds yet a few more. A low battery indicator flashes for 250 uses (which human nature tends to ignore!) and a temporary battery supply is easy by simply connecting a new battery to the two light nodes long enough to enter the code and open up the lock. 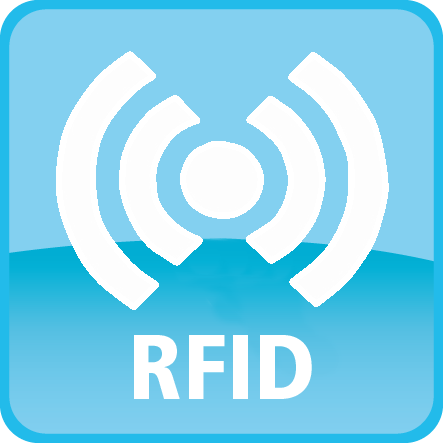 The RFID version offers even more versatility with up to 12 users, including master and service access in standard mode. In One Time Use Mode (Locker Mode) any compatible 125 KHZ RFID device presented (card, fob or bracelet) when the RFID Cam lock is open then becomes the same device to then close and open the RFID lock. One card can control multiple RFID locks, multiple cards to one RFID lock, etc. – All can be overridden with a master card for lost cards, etc. · Up to 10 year battery life! (8 year on RFID)- No periodic battery change hassle! The Combi-Cam E is an ideal electronic RFID cam lock for most applications featuring more compact design, longer battery life and more features at a better price! Sometimes also called Day Use, different users utilize the locker during the day. Each person walks up with their with a 125MHZ compatible RFID device (card, fob, bracelet) to an open lock / locker and after placing their items into the locker, uses their card to lock and later unlock the locker. 2. Hold middle of card to Combi-Cam logo for 3 seconds. Normal mode is one user assigned to one locker with their own card. Up to 12 users can be programmed to access each RFID electronic lock (including master and service cards). Any RFID lock that is in any mode, the use of the master card works on all locks (must be programmed in each lock when set up). The Master Card can also be used to do various programming to the electronic RFID lock. See instructions for more information. The RFID Locker lock can also be switched back and forth from RFID card access to numerical code access. See instructions for information on programming..